Today: A way to turn rutabagas into something elegant, without much effort. Recently, it became January, and I had no idea what to do with rutabagas. They look like hairy little aliens, a known cousin of turnips but somehow much more foreign. As far as winter doldrum vegetables go, they are the ugliest of ducklings. But pickings at the market are slim these days; those of us dedicated to eating at least somewhat seasonally must cozy up to some not-so-cozy vegetables. When I turned to my usual resources -- old cookbooks, the Food52 hotline, Google -- for rutabaga recipes, the only solutions I found were to cover up their flavor with fat, much the way we do when we layer on puffy coats and hats during, say, a polar vortex. We end up looking like the Michelin man; our rutabagas just taste like cream and butter. I knew they must have some redeeming qualities, aside from an ability to be roasted and mashed into submission. And finally, just like it happens at minute 38 of every Law and Order episode, the answer appeared: ask Alice. Alice Waters' latest cookbook, The Art of Simple Food II, is where you go when you need to know what to do with vegetables. (See also: Deborah Madison's Vegetable Literacy.) In it I found a recipe for Rutabagas à la Greque, which sounded quite fancy, considering its use of French to describe yet another European country. It also called for a few spices and herbs I was out of. But I was also out of options. So I greque-d my roots. 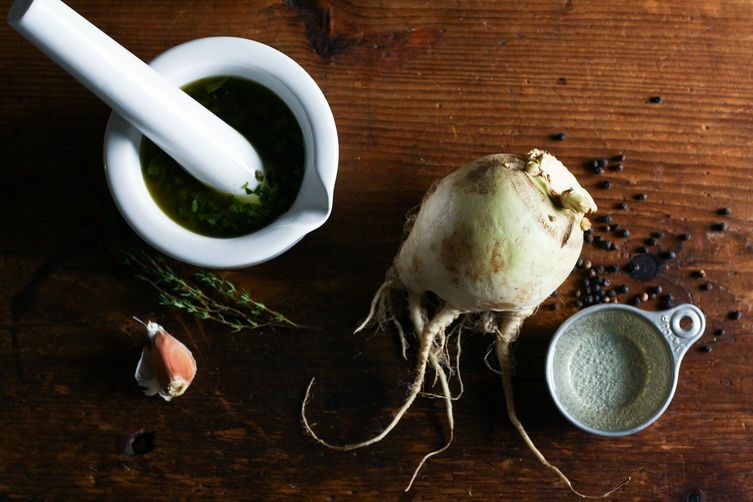 By simmering rutabagas in wine and vinegar and spices and aromatics, you straddle the line between poaching and pickling. The result is a plate of vinegary slices, soft but firm, spiced confidently but still actually tasting of rutabaga. It's a palatable way to eat the things without slathering them in dairy (you are encouraged to slather them in salsa verde, but let's call it a complement rather than a cloak). It's also, as Alice points out, a way to eat rutabagas cold, in a composed salad of sorts. So once you grow weary of pulling roasted cubes from your oven and scooping cozy mashes from your pots, make this. It's elegant but not fussy (you just boil, slice, simmer, and cool). It takes well to any flavors you throw at it. Eat it as a side, or a snack, or slipped into sandwiches. Eat it until spring finally happens again. 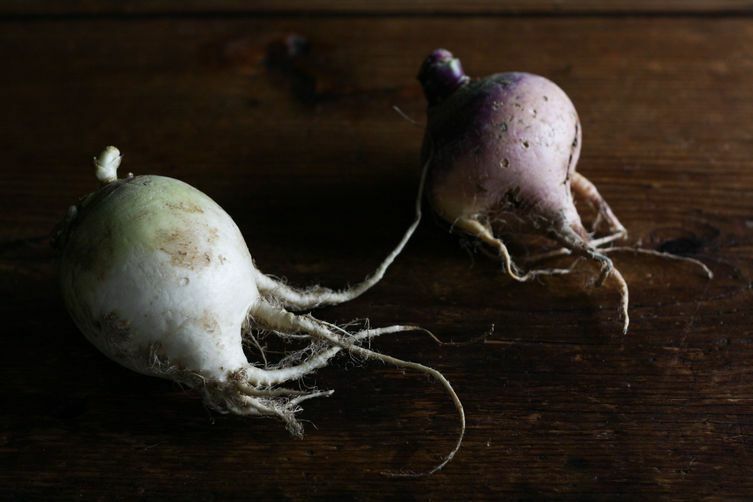 What yanks call a rutabaga is usually called a swede or a neep in the UK (a large yellow-fleshed turnip-like root). Oooo. THIS. The first time I tried a rutabaga it was steamed and plain — as unexciting as can be — and I still fell in love with the flavor. I've been guilty of adulterating them with copious amounts of butter and cream in my own kitchen, but all that is about to change. I'm not sure if I'll ever tire of cozy mashes, but thankfully now I have a sparkly new alternate for nights when I want to give my masher a rest. They look like dinosaur octopi! I love me some rutabaga. My favorite dish of late is Rutabaga and Leek Chowder with crisp smoky croutons from Deborah Madison's "Vegetable Soups". I didn't know this book existed!! I'll have to look it up. Sounds lovely. I love mashed rutabagas and rutabaga gratin, but I have never tried them any other way (ie. any way that didn't involve copious amounts of cream). This looks wonderful! So excited to try it. Also, I have developed a wintertime obsession with making a simple salsa verde with pomegranate seeds mixed. I bet that would be delicious with the rutabagas. WHOA that salsa verde just blew my mind. This looks amazing! 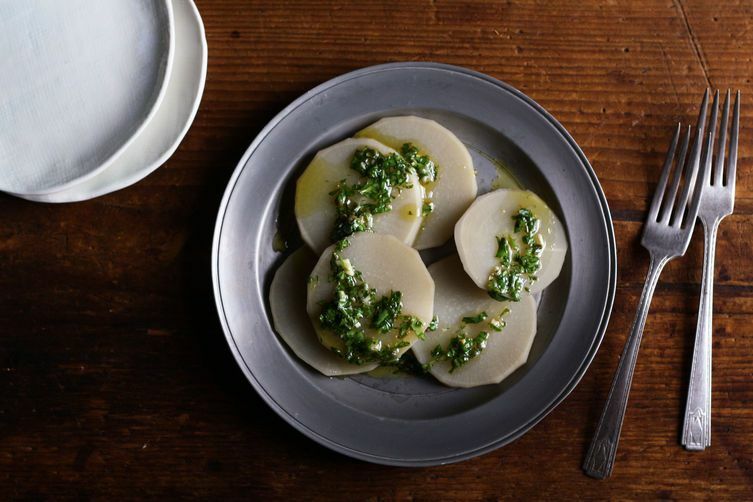 This may be the first post/recipe to get me excited about rutabagas. The salsa verde idea sealed the deal. I'm so happy to hear it! Maybe next year rutabagas will be the new kale. It's really very exciting. I want to half-poach half-pickle a lot more roots now (thanks Marian!). I'll start making pins + tshirts.